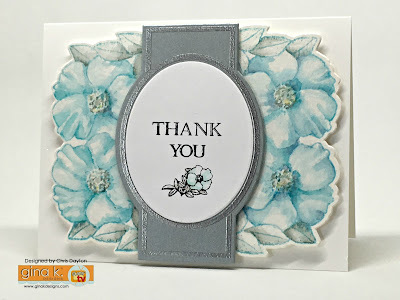 Cat Tales and Paper Trails: Gina K Designs Inspiration Blog Hop: Day One! 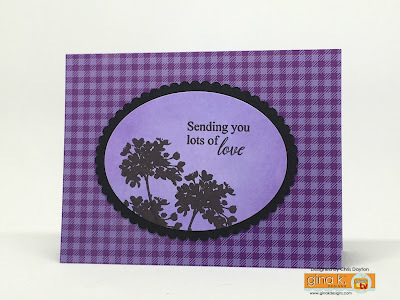 Gina K Designs Inspiration Blog Hop: Day One! You will have so much fun creating with these images and sentiments. I stamped Melanie Meunchinger's beautiful large Fabulous Rose Frame image in Distress Ink on watercolor paper and continued watercoloring using the distress inks. I then die cut the painted image and added it to my card base with foam dimensional tape. The belly band was stamped and heat embossed on Metallic Silver cardstock, and I added the white oval that was stamped on layering weight white cardstock and I added a bit of coloring with a matching Copic marker. Again, I used the gorgeous frame. 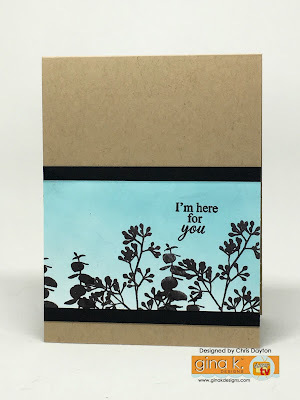 This time, I stamped with Kraft ink on Kraft cardstock. Then colored with neutral colored Primacolor pencils. I used the coordinating die to cut out the image, then decided to use a craft knife to also cut out the interior of the frame. 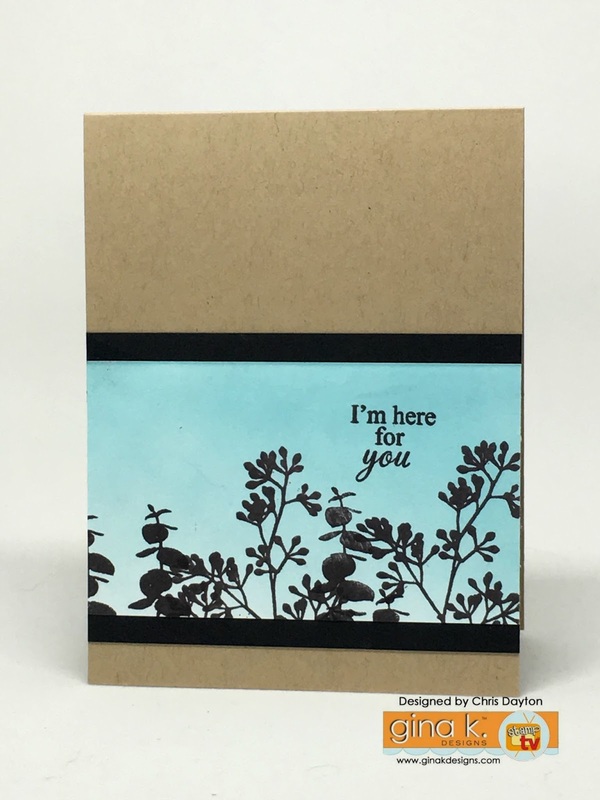 I determined proper placement, then used my MISTI to stamp and heat embossed the greeting in gold onto a Charcoal Brown card base. Then I added the Rose Frame with dimensional foam tape. Theresa Momber's amazing images lend fabulously for scene building. I used glossy paper and foam ink blenders and inexpensive small makeup smudge brushes to create this scene for the heron image from The Wetlands 2. 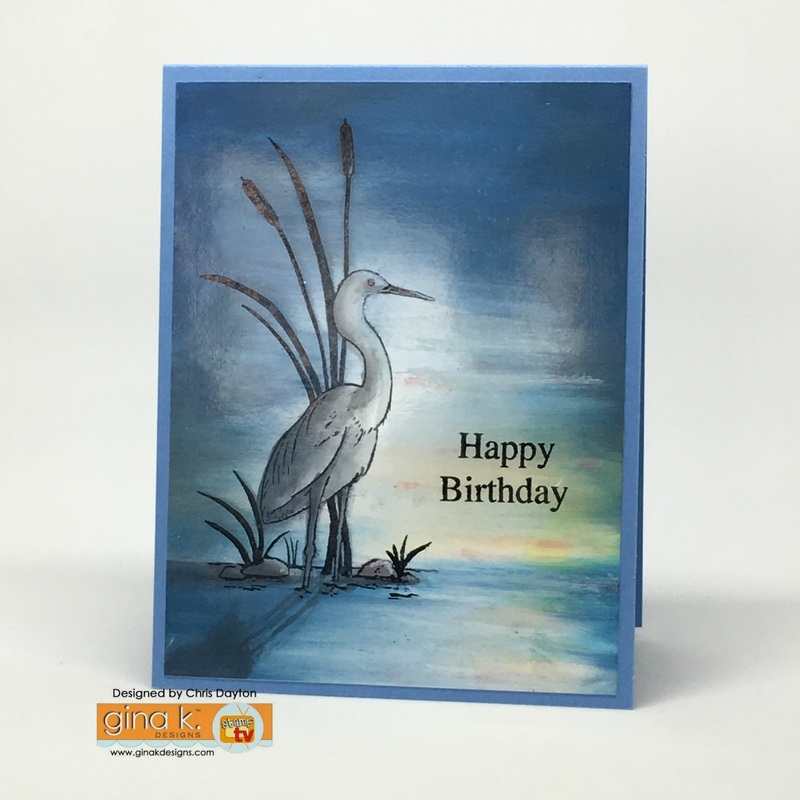 For this Wetlands 2 card, I created a second card using glossy paper. 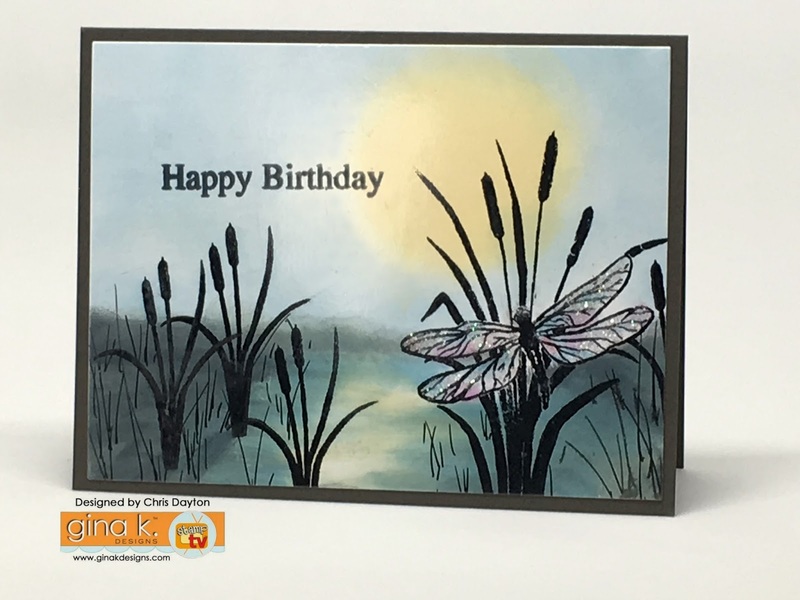 I used Stazon ink to stamp the dragonfly and cattails, then added more Gina K Designs inks to create this hazy summer scene. I applied a watered down layer of liquid glue to the dragonfly wings and dusted them with an iridescent glitter. I have one more card that uses Toned Gray sketch paper and Prismacolor pencils. I added warm grays, white and black to create a quiet dusk scene. Next up, are a few cards created with the new incentive set, Nurturing Blooms. This new incentive set (free with your $75 order), is a stunning silhouette set. 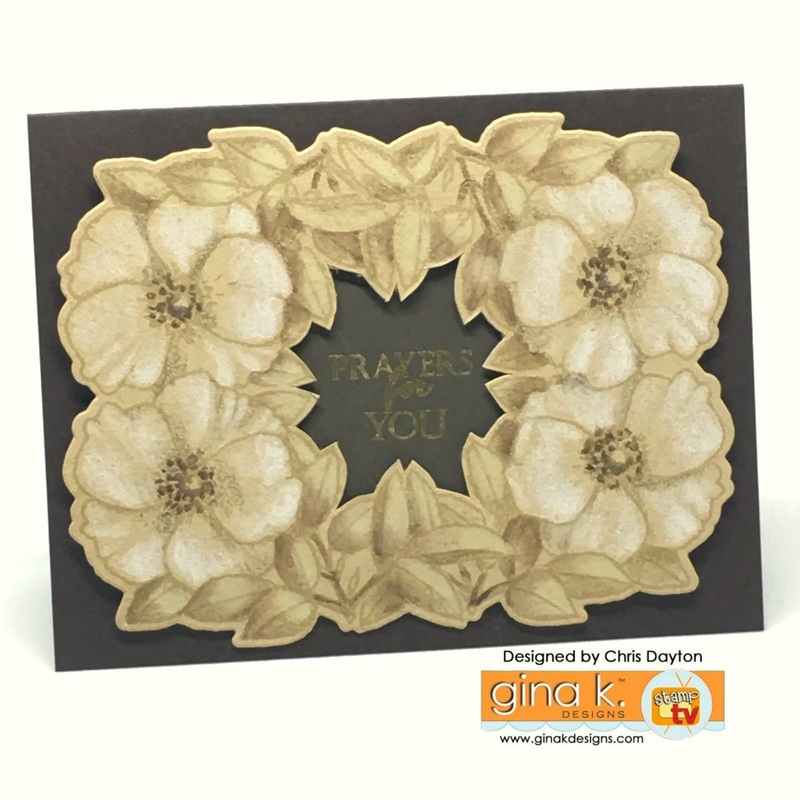 It's crisp floral images make very quick but elegant cards. Absolutely perfect when you need a last minute card! I added the hydrangea image to a Lovely Lavender and Wild Lilac inked oval for a quick thinking of you/encouragement card. This card uses two overlapping floral silhouettes in front of a Powder Blue inked strip for an uplifting card. Stunning, stunning scenes! I'm just blown away. Your coloring on the rose frame is amazing. Oh my goodness. every one of your cards is fabulous... artwork! Thanks for inspiring. Wow. The landscape scene is unbelievable. Wow. That is pure brilliance! Love them all. Wow, just wow! I could look and admire your cards all day! Each one such an amazing little piece of artwork! Love, love, love! I liked all of them, but the ones with the roses are my faves! all of your cards are just amazing. Beautiful coloring on the rose frames. You really shine with the wetlands stamp - such beautiful scenes and designs. Beautiful cards. I especially love the birthday Wetlands cards. Love the new release! And, your cards are so gorgeous. Can't pick a favorite. Beautiful cards! Love the wetlands cards as they are such a lovely scene. Holy smokes Chris! The are phenomenal! WOW, very well done! Love your cards. The gray tone really stands out to me. OMG I'm about to OD on your awesome cards. They are all so amazing. I love the kraft on kraft. It has such a delicate antique look, and the gray on gray is terrific. Thanks for the wonderful inspiration. Stunning cards!!! I especially like the ones using the Wetlands set. Absolutely stunning collection of cards Chris, all gorgeous, but that bird in the dusk light is just unreal, I adore that look, it is perfect!! Wonderful inspiration! Oh my! I thought you couldn't top the flower card using the kraft paper, then I scrolled down. With each card, my enthusiasm grew. That last card on the grey paper was just amazing. Wonderful, wonderful cards!!!! Wow! Love all of your cards! Think the kraft one is my favorite! Very unique! Thanks for sharing with us! Such wonderful cards! I love the cards you created with the wetlands 2 stamp set. Stunning! Beautiful projects, love the new sets! Outstandingly beautiful cards you have made. So inspiring! Love your work and your ideas. All of your cards are beautiful, but your first one with the blue and gray is outstanding! I kept staring at it and went to see your other designs and then went back again to the blue and gray. It's stunning! Your two grey-toned cards colored with Prismacolors are amazing. I love the subdued color scheme. I think it really lets to images shine. Lovely cards! My favorites are the first floral and the grey sympathy card...just amazing! All are amazing but absolutely love the grey Wetlands card. 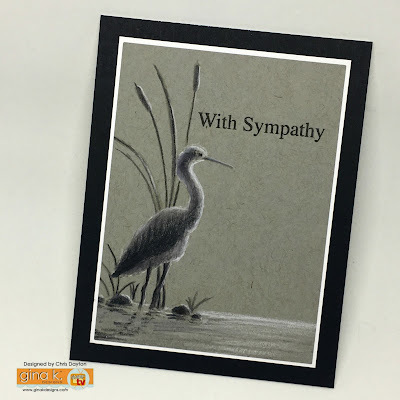 I don't believe I could say enough about these beautiful cards, I absolutely love them, and especially love the last one, it is so serene and beautiful, and is perfect for a sympathy card. I would love a tutorial, or a little more info on this one. Thanks so much for sharing. Stunning colored pencil and marker skills! Thanks for sharing your beautiful work! Each one is so beautiful! Your floral cards are colored beautifully! The backgrounds you created for the new Wetland 2 set are amazing. You did a wonderful job creating such beautiful scenes for the new stamps! Amazing 7 different beautiful cards! Wonderful design ideas and pretty colors. I like the dragonfly wings...sparkly and look transparent. Your backgrounds are just beautiful, i love the different techniques; adding glue to to give the dragonfly dimension is genius. Wonderful cards! And beautiful coloring! I love the scenes you created with the wetlands stamps. Just beautiful. Wow, your cards are amazing. Such artistic work. Absolutely gorgeous. Amazing cards! I love the scenes with wetlands stamps! Gorgeous and look so real!! Your cards are so beautiful. Very nice. Such beautiful cards!!!. Loved seeing dragonfly in set...they make me smile. These are all beautiful examples. For some reason each of the blue ones really stands out to me, from the blue roses, on down. The rise cards are lovely, but its your Wetlands cards that are gorgeously frameable works of art!!! Absolutely amazing creations!! You're soooo talented! !